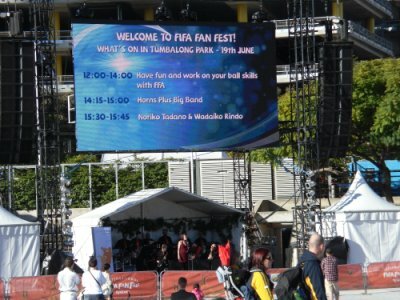 On Saturday, I was playing for the crowds gathered in the FIFA Fan Fest at Darling Harbour. Well, I say crowds; there actually weren’t many people there. This probably had something to do with the fact that neither the bar nor any of the food outlets were open. 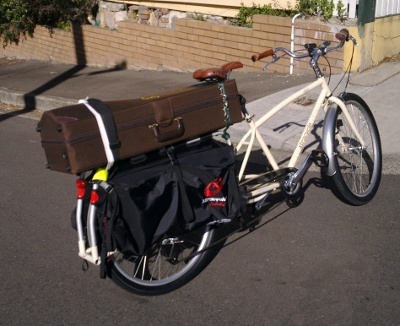 Anyway, given that Darling Harbour isn’t far away, I thought it was an excellent chance to try transporting my trombone (and related paraphernalia – music, mutes, beer etc) on the Radish. So I strapped the ‘bone on the back of the bike, and set off. I didn’t want to get changed when I arrived, so I was wearing the band outfit – black shirt and pants, dress shoes and an orange tie**. I got a lot of strange looks going over ANZAC Bridge; I wasn’t sure whether they were directed at the bike, the trombone on the back or my outfit. 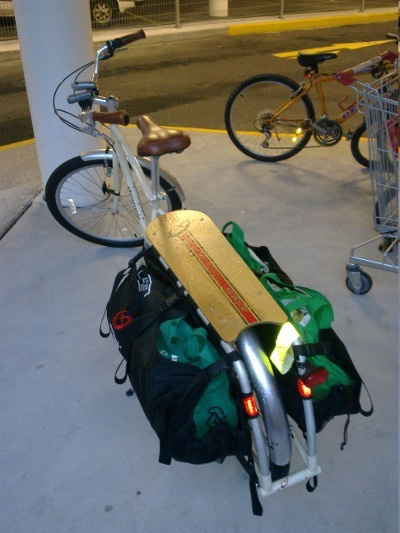 It was pretty heavy, and of course the weight is higher than in the panniers. Still it handled pretty well, and i didn’t work up too much of a sweat going up the hills. The security guard at the entrance to the FIFA enclosure did give me a suspicious look as I rode in, but when I explained I was with the band, he waved me through. The other band members were a bit incredulous too; there had been some email exchanges about sharing lifts, and I had mentioned I was going by bicycle. ‘Did you actually come by bicycle?’ one of them asked. Kinda strange when my two hobbies collide; I guess my cycling friends don’t see me playing much and my musician friends rarely see me on a bike. Although that may change, now that I’ve successfully taken the trombone for a ride. Rehearsals are in Lane Cove though, so getting over Gladesville Bridge on the Radish with all that weight might be a challenge (although one I shall have to attempt)! **all sing together now… ‘..orange coloured ties…’ We did have that song in the set list, but had to drop it as we ran out of time. I was a little late leaving work tonight, which meant I had to dash back so that I wasn’t late getting home. I jumped on the bike after escaping a meeting that had run late, and powered through Sydney. I was riding the fixie. I love my fixie. I’ve been riding my other bikes a lot recently, including the heavy (and slow) Radish, and the tourer with panniers and so on, and getting on the fixie was just a joy. It is my favourite bike, I have to say. Just so much fun; it accelerates like nothing else as I leave cars behind me when the lights change. And I was a god in the Tour du Pont d’Anzac; my competitors were left floundering, still struggling to clear the spiral ramp as I breached the apex of the bridge (remaining, of course, mindful of pedestrians unaware of the unfolding sporting drama around them). The cool weather is great too; as the cold air flows over your hot muscles you just feel glad to be alive, your body tingling with the electric thrill of the ride. I shot up the final hill, turned into my street and screeched to a halt at the front gate. Was I in time? Quickly I wheeled the bike into the shed, and went into the house. I was in time! There was my daughter, in the arms of Mrs Chillikebab. As I entered, she gave me a glorious gummy ‘welcome home Daddy’ smile. Thanks to the trusty fixie, I had got home in time to give Baby Chillikebab her bath! However, there was no time to lose; she was getting tired and bedtime was looming! Without bothering to change, I got her a nice warm bath ready. A quick cuddle with Baby Chillikebab, and then into the bathroom for funtime bathtime. I lowered my daughter into the water, expecting the usual gurgly splashy smiles. But something was wrong! Baby Chillikebab stared at me in horror as she went into the water, before breaking into inconsolable wails! What had happened? Mrs Chillikebab came in, and felt the water. ‘It’s really cold!’ she said. Oh no. My hands and arms were still very cold from my ride home. What had felt nice and warm to my chilly fingers was no more than tepid to a baby taken from the cosy embrace of its mother’s arms. I attempted to console Baby Chillikebab by wrapping her in a warm towel while the water temperature was adjusted, but it was too late. The spell was broken, and bathtime funtime became a succession of indignant screams which did not abate until Baby Chillikebab was clean, dry, warm, dressed and back in Mrs Chillikebab’s arms. #253: If you are going to be giving a baby a bath shortly after riding in cool weather, wear full-fingered gloves. I suppose this is a kind of Gothic horror novel, but it’s very engaging and beautifully written. It is a dark tale of murder and obsession. It is the story of Grenouille, an unloved, unwanted child born in the slums of eighteenth century Paris. Grenouille has no capacity for love or affection, but he does have an extraordinary nose, capable of discerning the most delicate of scents and analysing the most complex of odours. On the one hand he shuns human contact, but he also craves being accepted into the society that ignores or rejects him. He sets out to use his talent in a most calculated way; to create a scent that will make people like him. He learns the perfumers art in order to create the ‘perfect scent’ – a scent he finds one day and falls in love with. It is the scent of a beautiful, nubile young girl. 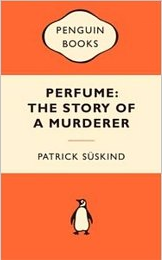 As he goes about capturing and recreating this scent, the people he is involved with come to a miserable end – and ultimately he kills many innocent girls in his attempt to trap their scent. The descriptions of various scents are beautifully written, and really evoke a whole world of smell that we are perhaps inured to. This is a very strange book in which Patrick Süskind takes the reader on a fantastical journey – well worth reading. What do you get when you cross an after dinner mint with a biscuit? Answer: Arnott’s Mint Slice. This is a very classy biscuit. A rich chocolate biscuit base, topped with peppermint cream (flavoured, as the pack proudly proclaims, with real peppermint oil) and finally enrobed in smooth dark chocolate. They even look classy, with their smooth chocolate coating and even layer of mint cream. Am I sounding like an advert? Apologies if I am, but I do rather like these biscuits. Indeed, to my mind they are nicer than the Tim Tam (there, I said it! ), although I have a feeling I’m going to regret mentioning that. Despite their richness, this is a biscuit that it is extremely easy to eat a whole packet of. Sit down with a packet of Mint Slices, and – whoooof! – they are all gone. I’m not the only person to comment on this; several friends have made the same observation. Indeed, it’s got so bad in the Chillikebab household that we have to have two packets of Mint Slices in the fridge, labelled separately for Mrs Chillikebab and myself. Mrs Chillikebab has such self control she can eat perhaps one or two biscuits at a time, and make a packet last for week. Occasionally I can make a packet last two days, but that’s very rare. I’m going to go all out and give these a ten out of ten, although I’m not quite sure where that leaves me should an even better biscuit come on the scene. On Sunday, the Radish came into it’s own. Indeed, up until Sunday I had failed to fully appreciate the fun there is to be had on this machine; however I am now a confirmed Xtracycle fan. It came about because we had to go and get groceries. Mrs Chillikebab initially wanted to go, as sending me with a list wasn’t god enough, as ‘I wouldn’t buy the things that she didn’t know we needed‘. Hmmmm. Mrs Chillikebab and I have very different ideas about shopping. In my world, you take a list, and the objective is to get in and out of the store with the items on the list in the least possible time. Aisles that do not contain things on the list are shunned. Speed is of the essence; collecting things from the shelf without reducing the speed of the trolley is to be encouraged. In Mrs Chillikebab’s world, you browse all the aisles, just in case there is something lurking that you didn’t know you needed. And each item should be carefully selected, the price of alternatives weighed up, and carefully placed in the trolley to avoid damage. Anyway, Mrs Chillikebab ended up not being able to go because of Baby Chillikebab’s feeding schedule. So I had to go with the list. And of course, I had to go on a bike. This was it! 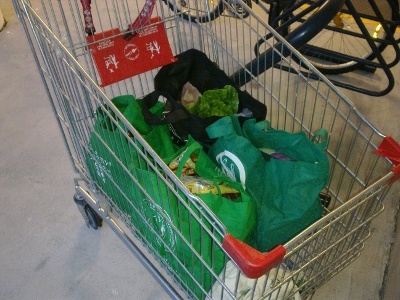 The moment I had been waiting for – a fairly big shop was needed, and the Radish was waiting. An additional complication was that it was pouring with rain. This was about 5pm on Sunday, and it was lashing down. Still, there’s no such thing as bad weather, only the wrong clothes, so I dug out the full waterproofs, and armed with waterproof over-trousers and a cagoule I set off. I arrived at Birkenhead Point, and got the shopping. Lots of vegetables, milk, cans etc. Four of those green re-usable bags worth. I wheeled the trolley out to the bike, and loaded up. Now, there is something supremely satisfying about wheeling a shopping trolley to your bike to load it up. I don’t know why, it’s just a great feeling. Like you are doing something deeply subversive. Then, the ride home. Uphill. How was this going to go? Well, the answer is like a dream. This bike handles magnificently when loaded. If anything, it rides better with all that stuff on the back. Just so stable and easy. Even the weight didn’t seem noticeable; I just cruised up the hills. In fact, I was so pleased I thought I’d get a bottle of wine to celebrate, so rode into the drive-through bottle shop at the Sackville Hotel. I pulled up behind a car, propped up the bike on its stand and went to get wine. That pleased me too; it just looked very cool seeing the bike there in the middle of the queue of cars. The wine (a nice Pinot Noir, to go with some bonito we bought earlier in the day) was stowed along with the rest of the shopping, and I rode home feeling very satisfied. Now I can’t wait for the next shopping trip; I reckon I can get a much bigger load than that on the bike. Those green bags were not much more than half full, and I think the Radish will swallow them just as easily when they are filled to the brim. Today, something different. Notwithstanding my faint disquiet about an organisation that exhorts its members to ‘do my duty to God, to serve the Queen and my country’ (not much there for an atheist republican anti-nationalist) I had the opportunity to try a Girl Guide biscuit today. These are sold by the Australian Girl Guides in May and June, and is their major fundraiser. Apparently they sell around twenty million of them – around one per Australian (as they note). I had two, so I guess someone else will have to miss out. Sorry it that was you. The Guides provide a wealth of exciting facts about the biscuits, including that put end to end they would surround Uluru 73 times and that they have been made to the same recipe for 55 years. 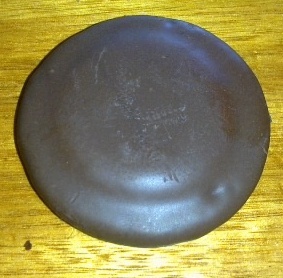 Each packet contains fifteen biscuits, each measuring 69mm across. An aficionado of these biscuits insisted that ‘they have got smaller’. This phenomenon is well documented in economic circles as the ‘biscuit anti-inflation index’; a fluctuating figure that tracks how fast consumers perceive their biscuits are shrinking. Theories abound as to what drives this index; like a lot of economic theory it is not fully understood. However, experts on the matter generally fall into two main camps, the ‘insisters’ (who believe the index is linked to the actual size of the biscuit) and the ‘externalists’ (who believe it is chiefly linked to external factors such as hand growth and happiness quotient). I only had the opportunity to try the ‘choc’ variant, although there are also plain an ‘mini choc’ lines. The packet is green; I’m not quite sure why as the Guides corporate colour seems to be blue. I somehow expect biscuits in a green pack to be mint flavoured. So strong was this association in my mind that I thought I could smell mint as I opened them, and only later realised that this was some form of nasal illusion. 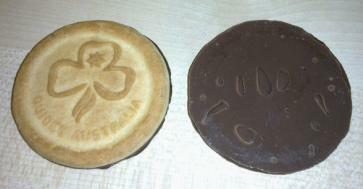 They consist of a shortcake-style biscuit embossed with the Guides logo, with chocolate flavour coating on the back. These biscuits are designed to be placed chocolate down – somewhat unconventional, but showing off the logo is obviously the point. The biscuit itself is kind of OK – plain, quite short and crumbly. It contains no butter, and is nothing special – just a fairly cheap plain biscuit. Perhaps a bit ‘institutional’; but then it is institutional, so lets not hold that against it. The whole thing is ruined, however, by the ‘choc’ coating. It’s not actually chocolate; it’s emulsified vegetable fat flavoured with cocoa powder, and it tastes exactly like that. It’s really quite nasty; I’m not sure if this part of the recipe is also 55 years old, but if it is it needs updating with more modern chocolate technology. As they are, you should think twice about who you offer them too, in case the poor quality ‘chocolate’ offends them. I’d really think twice about serving these to the Queen, for example, notwithstanding the Guiding promise. Perhaps it’s safer to stick to the plain variant. Only a two out of ten for these, I’m afraid. I have bought a new bike. It was going cheap in the Dirtworks yard sale, and I just couldn’t resist. Here is is, in all its glory. What a machine! It pretty much ticks all the boxes, with the exception of hub gears. And it just looks so cool. ‘Like a Harley’ was how one (non-cycling) friend put it. Those handlebar grips are hand-stitched imitation leather, people. And those tyres are over two inches wide. All my non-cycling friends love it. I have had more complimentary comments from people at work about this bike than any other I’ve ridden. People are intrigued by the platform on the back, and ask ‘what’s it like to ride?’. People want to have a go on it. It’s a bit similar to what happened when I bought the Aldi bike, and people wanted to try it out. It makes me reflect on some of the things Mike Rubbo talks about with regard to upright bicycles and their effect on cycling culture. I have to say, it is strangely liberating to jump on this bike wearing my jeans, pedal to my destination and hop off, ready to go. The cool weather helps, of course, but it does make me realise that I probably wear ‘cycling clothes’ when on short trips as much out of habit than real necessity. Part of the equation is, of course, riding slower. 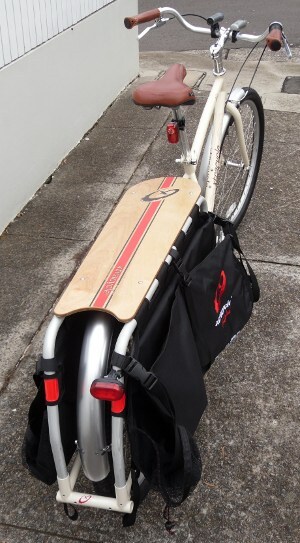 This is a bike to cruise along on, rather than a bike to work up a sweat riding. The seat is set back, the handlebars are right there and you just can’t get up out of the saddle for a sprint. Just sit back, click down the gears and enjoy the scenery as you cruise by nice and slow. it’s a very different way to cycle. And those gears are quite low. I haven’t actually looked up the ratios, but that’s a small front chainring coupled to some hefty gearing. You need them, as this thing weighs a ton. It’s a lot like driving a bus, actually (not that I’ve driven one, but hey!) – slow to get going, capable of getting up some speed on the downhills but lacking in manoeuvrability. Steering takes some getting used to. Apart form the fact the handlebars kind of bash my knees when cornering it has such an extreme castor angle that it really prefers to go in a straight line. Sharp, low-speed corners feel a bit weird, especially with the extra length and the thick, soft tyres. Cruising along on the flat, though, is lovely. Big balloon tyres (40psi!) soak up the bumps, and you just feel like waving to everyone as you go by. Especially small boys who point you out to their dads and cry out ‘look at that man on the funny bike!’. Hills are a bit harder, but you just go slow and steady. My best ‘score’* on this bike is only two, which gives you an idea as to the ponderous nature of climbing hills. 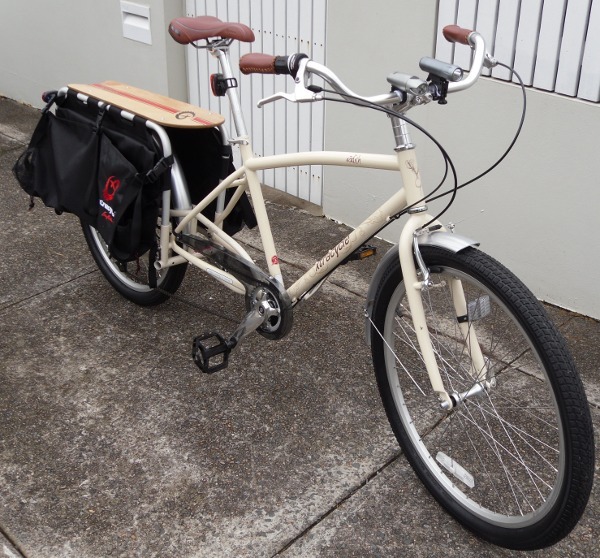 Still, the low gearing makes it possible, and I can ride this bike to work from the Inner West to the top of North Sydney quite easily. And the brakes are awesome. The long wheelbase and weight on the back, coupled with the amount of rubber on the road means that this thing stops on a dime, notwithstanding the weight. (It has a disc brake on the rear, but not on the front.) The only real problem is that it’s a bit small; it’s a ‘one size fits all’ proposition, but in reality I’m a bit too tall and am not quite comfortable. The marketing for the bike features images of women riding it, so perhaps that’s their target market. The other gimmicky thing is the pedals; they have a kind of dynamo in them which light up some LEDs as you pedal. Well, actually they don’t; experimenting with them shows that in order to generate enough power to light them up, you need to be riding with a cadence of about 300. Now I know those gears are low, but that’s a tad ridiculous. However, the dynamo mechanism prevents you putting your feet close in to the cranks (as they stick up on the inside edge of the pedal). I’m going to have to change these, I can see, as I like to have my feet closer together when riding. It’s the old one banana thing. The reaction of my cycling friends to this bike has also been interesting. ‘WTF?’ is a common reaction, and many of them simply cannot comprehend why I bought it. Heavy, slow, less nimble in the traffic. And as for riding in jeans, well, just think of the chafing! More fool them, I say. I am on the cutting edge of bike fashion; I rode a vintage 80s racer until they got popular, then a fixie until the fashionistas took over, when I bought a panniers-and-rack commuter. Well, this is the new bleeding edge, folks – upright cargo bikes. You heard it here first. Give it three years, and you’ll take back the scoffs as you jump on your Dutch bike in your suit.